Before we get into the nitty gritty, we need to understand a few properties of wood that will effect the colour over time. The colour of timber is caused by natural pigments. This is defined by a group of chemicals known as quinones and polyphenolic compounds. Quinones are the true pigments, as the polyphenolic compounds are clear. However they can become important over time, as will be discussed later. All timber contains what are generally referred to as “extractives”. Extractives have been discussed earlier in a few previous articles, but are the pigments, tannins, and other resins. They can be ‘extracted’ with a solvent such as water or mineral turpentine, hence the name. Another key component of timber that can effect it’s change of colour over time is lignin. Lignin is the glue that holds the timber fibre together. It is the most important structural component of timber. Exposure to rain bleeds out the extractives, including the natural pigments (quinones). This process lightens the colour of wood. Exposure to UV breaks down the lignin into simple sugars. These sugars act as a food source for moulds, which can be dark and blotchy in appearance. But in situations where they are controlled, such as in dry or coastal climates, they don’t develop fully so turn the timber a silver-grey. Sapstain or Bluestain moulds are usually an issue when the timber is freshly cut. They thrive on the extractives and high moisture content of green timber. They tend to be a dark blue-grey or black in appearance, hence the term “Bluestain”. The damage that they do over time is superficial as it usually effects the outer layer only. The main cause of staining through introduced causes, is Iron Staining. This happens when wood is sprayed with welding spatter or grinding metal. The iron then rusts when exposed to water leaving small black blotches over time. In addition, the Iron also reacts with the tannins, which are quite dark. This could also be classed as a chemical change as well, but it’s been classified here. Remember that we discussed the polyphenolic compounds with the quinones in the introduction? When they are exposed to air and a little UV, they oxidise to form quinones. So they go from being clear to a defined colour. This darkens the wood over time. Exposure to light, even ambient light, causes tannins to slowly oxidise. This can create a yellowed appearance over time. 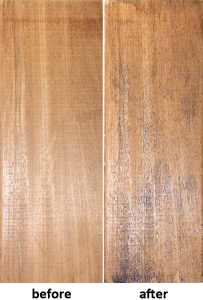 It is very common in light coloured timber like Blackbutt or Radiata Pine. Introduction of alkali or acidic material like glue or finishes, can cause unexpected reactions with various components of extractives. Leeching of extractives can cause water marks on timber, especially when freshly cut. The water draws out and concentrates the extractives on the surface. How do you prevent these colour changes? UV Weathering is the most difficult to control, while keeping the wood looking natural. Using a properly formulated and lightly pigmented product like Aussie Clear or Aussie Coat. They will slow the weathering process down over time, but won’t completely stop it. So you need to regularly maintain them over time. Think of it like sunscreen if you’re out in the sun. You have reapply throughout the day to prevent you getting badly burnt, but it won’t completely stop it. Iron Staining prevention is very straight forward. Don’t conduct any metalwork on or near unsealed timber. Also, don’t use a metal based scouring pad or steel wool to prepare the timber surface. Always use sandpaper made with glass grit. 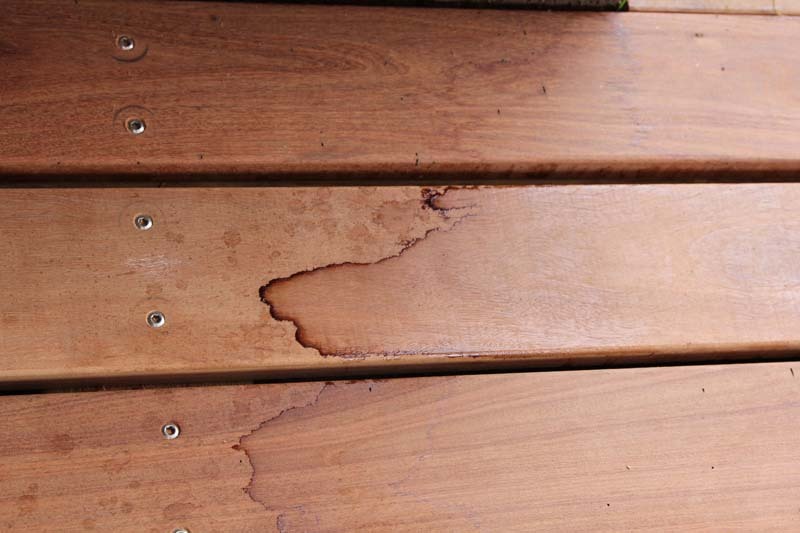 Prevent fungal decay by using a registered timber preservative like Timber Preserver or No Rot Gel, but note that these products can effect the colour, or are unsuitable for weather exposed situations. Prevent sapstain/bluestain moulds by using a properly formulated finish like Aussie Clear or Aussie Coat, that contains an ingredient to prevent it’s growth. How do you remove unwanted colour changes? 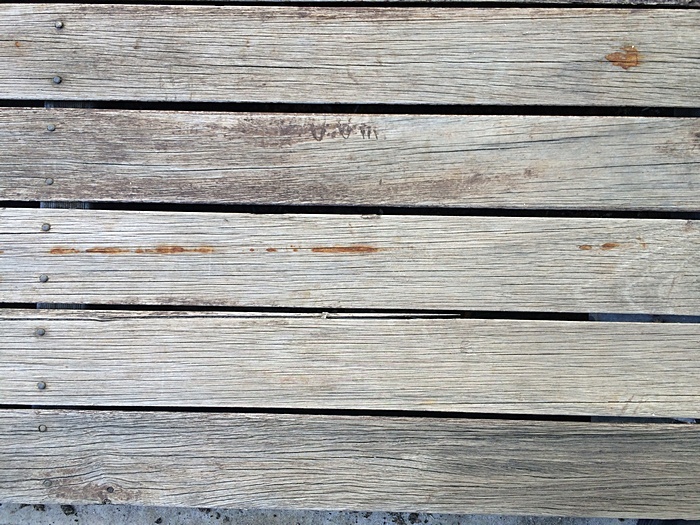 For UV weathering, use an oxalic acid timber cleaner like Grey Deck Cleaner. A pressure washer is also a useful tool. But if the weathering is quite heavy, a light sand prior to the application of Grey Deck Cleaner is recommended. For sapstain or bluestain moulds, use Grey Deck Cleaner or D-Mould to kill it. Then use a formulated finish like Aussie Clear or Aussie Coat to prevent it’s recurrence. For water marks caused by extractive bleed, use Grey Deck Cleaner. To remove yellowing or darkening of interior timber, lightly sand the finish and/or wood itself. 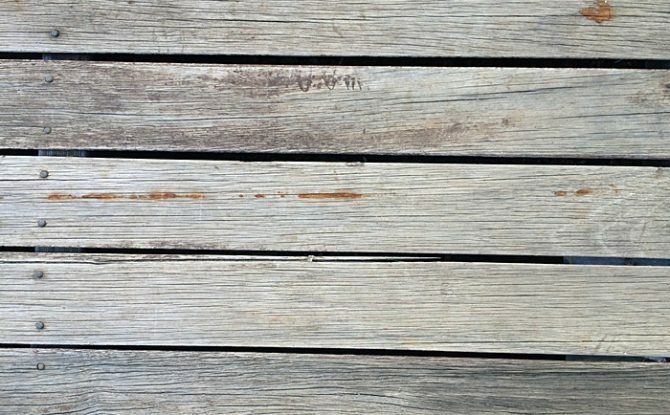 One thing to note with all the issues discussed with the exception of timber decay, is that the factors that cause timber to change colour usually effect the exposed surface layer only. They do not effect the timber internally, and most do not do any real or long term damage. Great article Rohan, many thanks! Thanks for the detailed information regarding timber colour change. Its useful to prevent timber and also to repair the damage. You’re welcome. Feel free to also ask other questions on timber and its properties. It may be worth another post that’s more specialised on a specific topic. We want to stop pine rough sawn weather boards from going grey and don’t want to use a coloured stain. Will a clear sealer stop this ? Maybe even a concrete sealer? Thank you for your enquiry. Which species of pine are you using? This is important because if it’s Radiata Pine, it requires to be treated to H3 as it is not durable (Class 4 above ground as defined by AS 5604 has a probable life expectancy of 0-7 years without treatments). Other species of pine may or may not be durable and/or treated. If it’s treated (radiata) pine, then the treatments will assist in keeping the timber from grey weathering. As I stated in this post, grey weathering is a type mould that grows after the UV from the sun breaks down the lignin in the timber into simple sugars. The mould feeds off those simple sugars. But the primary treatments are also toxic for the mould, as well as fungal decay. In this case then you can use either Radial Timber Sealer or Exterior Pine Clear. Neither products have a pigment, but as a result, neither have any UV protection either. So this solution is only valid if your weatherboards are treated softwoods as per AS 1604. Otherwise, you will have to use Aussie Clear or Aussie Clear light to prevent UV weathering. But these are pigmented with a “transparent” pigment rather than the “opaque” pigments used in stains. These “transparent” pigments are the only effective UV protection which will drastically slow down the UV weathering process. Aussie Clear Light as the name suggests, is suitable for light coloured timbers. It will approximate wet straw. We can supply you with a sample can that you can brush out onto an offcut to see if you’re happy with it. I just finish sanding my wooden floor. I like the natural look of pine wood floor. Could you tell me what I should do to preserve the ‘raw’ look of pine wood after sanding? Hope I can do something to keep the colour light and no yellow or shine as well as the pine floor hardens to stop scratches and marks. In terms of hardening the floor, you are limited by the natural hardness of the timber. Most pine species will tend to be of low to moderate hardness. There are no floor finishes that will improve that situation that I’m aware of. I would recommend that you make sure that your furniture have soft pads on its feet and if possible, have a bigger foot. This will spread the weight over a larger area so decrease the likelihood of marking. Fabric furniture pads are available at most hardware stores. You could use a traditional linseed oil (or tung oil) with thinners and terebin drier, which will naturally deepen the colour and highlight the grain features, but this will have to be re-applied on a regular basis like a decking oil. In terms of the hardest wearing floor finish, then consult a specialist paint store. I know when I did my floor a decade or so back, the 2-pack epoxy finishes were still the hardest wearing and most resistant to scratching etc, but it has yellowed with sunlight. But be prepared to move out for 1-2 days as the off-gasses as it cures are very strong. The water based finishes don’t tend to yellow and may have come a long way in the last 10 years in terms of their scratch resistance. So speak to that specialist paint store. They have excellent product knowledge. I hope that this information has helped. I have just finished laying a red gum decking that has been stored for about 3 years. I sanded the deck and purchased a tin of natural finish ultra deck and coated a few 4 meter lengths with one coat. I was hoping for the reds and pinks would appear as they do when the deck gets wet. But no, instead I have a dull yellow tint that looks a lot like merbau. I have now sanded all off it off and am looking for a better option that gives me reds that I am after. Do you have a product that will do the job? Thank you for your enquiry. You caught me at a good time as I’m off on leave tonight. In answer to your question, we do. Aussie Clear. Unlike the Ultradeck, which is a “low build” film forming modified acrylic finish, Aussie Clear is a true penetrative oil. It’s not better than, or worse than the Ultradeck, but it is different in how it performs over time. I have more details on Aussie clear with these links, but remember that Aussie Clear will darken the timber and it’s designed to bring out the natural features of the timber. This includes the natural colour. It is also lightly pigmented as is discussed further in the first and second link. A quick rule of thumb test if you have an offcut handy. Apply some cooking oil to the redgum. That is more or less what will happen when you apply Aussie Clear but it will be darker. If you are still unsure, then we can arrange a sample can for you to try, but this won’t arrive to you before Easter, unless you live locally in the Cheltenham area. but we close at 4pm tomorrow.